The Library of Birmingham is hosting a temporary jail, but those visiting can leave when they like. Fear not - there hasn't been a marked increase in crime around Broad Street (as far as we're aware. The unit is actually the work of Stoke-on-Trent arts organisation Rideout who've created an exact replica of a UK jail cell - complete with two prisoners - to draw attention to the crime and punishment debate. Visitors can drop by at any time to have a look at, and enter, the cell and also chat to the prisoners inside - who are both former inmates of HM prisons. Rideout's Go To Jail: how would you feel about spending 23hrs a day in a space this size with a complete stranger? The cell is just 3.7m x 2.5m. It contains a bunk bed, a desk unit, two chairs, sink, toilet and a mirror. 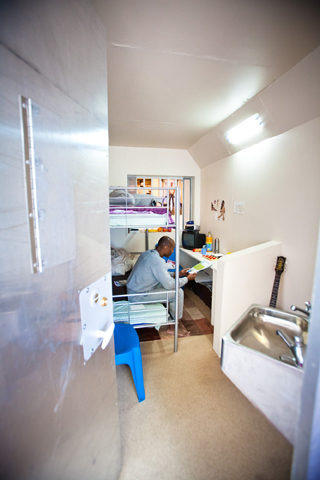 Prisoners can spend up to 23 hours a day confined in such a space. Those visiting are encouraged to discuss prison with the actor/ inmates, and find out more about what life is really like in a UK prison. The majority of people have little idea about the actual living conditions in a prison (unless they've 'served time' themselves). With fictionalised or extreme depictions on TV, the truth is hard to imagine. Entitled Go To Jail, this project helps redress that balance. Go To Jail runs from Tuesday 1 to Saturday 12 March 2016 in the Floor 3 Gallery at The Library of Birmingham, Centenary Square, Broad Street, Birmingham B1 2ND. Open Tue-Sat, from 11am-4pm, admission is free - no pre-booking required. For more information see: www.gotojail.info - where you can also see a live stream of the jail cell (during opening hours). Go To Jail's replica prison cell. Why? 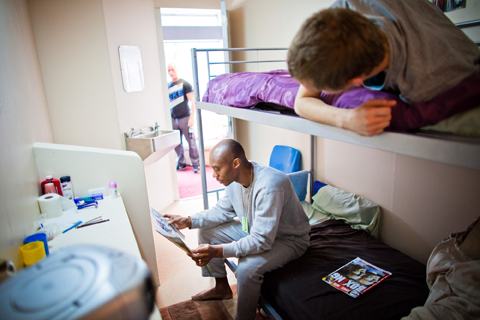 Find out more about life in prison.